It is now well-documented that large-scale logging by foreign-owned companies does not bring lasting development to the communities who suffer the often devastating environmental and social impacts. This fact was acknowledged by government more than a decade ago when the Log Export Development Levy (LEDL) was introduced. The levy is an additional tax paid by logging companies on every cubic metre of timber they export. All monies collected is then supposed to be used by government to fund the agriculture and infrastructure development projects in communities impacted by logging that the companies so frequently promise, but so rarely deliver. Image: Logging company roads last no longer than the logging itself. 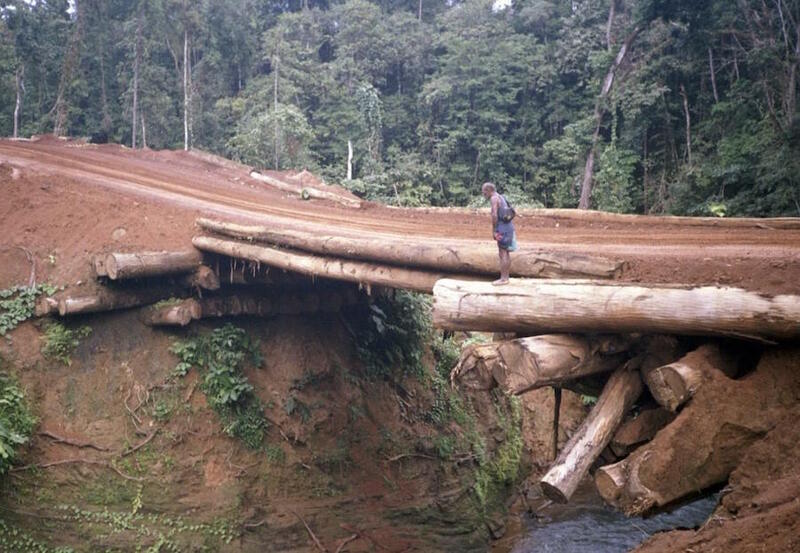 The Log Export Development Levy was supposed to fund permanent infrastructure like steel and concrete bridges. Unfortunately, government has proven to be no more reliable than the foreign logging companies in upholding its side of the bargain. Between 2012 and 2015, more than K100 million in levies was collected by government and placed into a trust account. However, in a devastating set of findings, the Auditor General has revealed how those funds, intended to alleviate suffering in logging communities, have been stolen and misused. The levy has never been increased in-line with inflation and declined in value by 40% between 2006-16 – giving logging companies a windfall worth tens of millions of Kina. Overall the AGO found there were ‘low standards of accountability and transparency by the agencies involved’ – the PNG Forest Authority, PNG Customs Service and the Department of Finance. The ‘low standards’ included a complete absence of accounting records and supporting documents for the administration of the levy trust funds. Further compounding this injustice are the findings of the Oakland Institute, published in 2018 and 2016, which show how logging companies also defraud the State of tax revenues by continually declaring losses from their operations rather than profits. Bizarrely, the more they log the greater the losses they declare. In 2017 the Auditor General’s Office (AGO) published the results of a performance audit on the effectiveness of the management of the Log Export Development Levy (LEDL) over a four year period from 2012-15. LEDL is a customs duty imposed on log exporters at the rate of K8 per cubic metre of the total volume of non-plantation logs they export. The funds collected are paid into a trust account managed by a Committee who are responsible for the disbursement of the funds. The Committee members are the Secretary of Finance, the Secretary of Planning and the Managing Director of the PNG Forest Authority (PNGFA). These three top public servants also act as the trustees of the LEDL trust fund. Since 2013, the PNGFA has been responsible for the trust’s administration. The PNGFA is also supposed to undertake independent project monitoring visits to project sites to verify the implementation of LEDL funded project. It is to assist the Committee in evaluating project proposals as well. A Technical Evaluation Committee exists to undertake these roles. 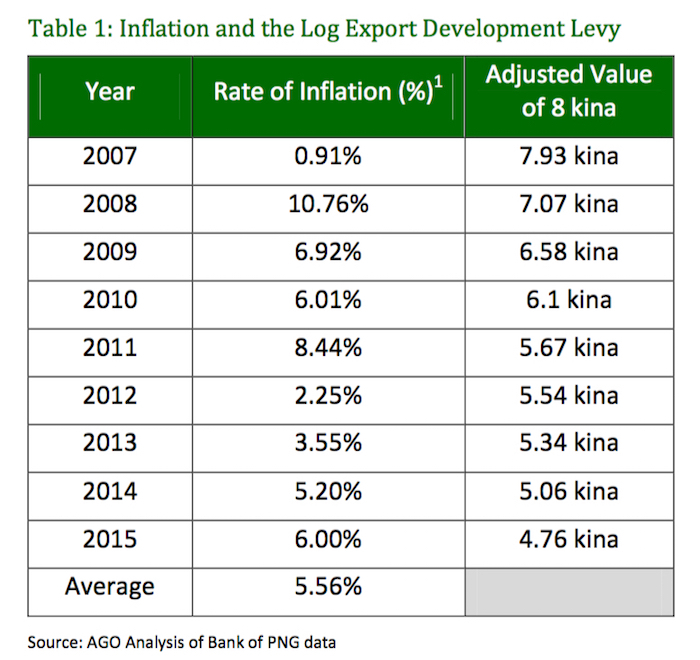 Between 2012 and 2015, more than 14 million cubic meters of logs were exported from PNG and more than K105 million was paid into the LEDL trust account. The amount could have been far greater, but the levy has not being reviewed or adjusted since it was introduced in 2006. Taking account of inflation, the AGO has calculated the K8 levy was worth just K4.76 by 2015, more than 40% less than when it was when it was introduced. The AGO also found the K105 million that was collected appeared to be between K6 million and K7 million less than expected when compared to the volume of logs exported. While the actual volume of logs exported was not available from the Customs Service, the AGO was able to compare the sums collected with the volume of exports declared by the third-party monitor, SGS. Not that the government has made good use of the monies it has collected. The AGO reports that between 2007 and 2015, eighty-four project proposals were received for funding from the LEDL. Of these, only twelve were evaluated by the Forest Authority (PNGFA) and recommended to the LEDL Committee for funding. The total value of these 12 projects recommended for funding was just K24.52 million. That is less than 25% of the monies actually collected in just the four years from 2012-16. This points to a complete breakdown in the whole LEDL process. Clearly too few projects are being recommended for funding. The AGO report though reveals things are even worse than this. Of these twelve projects recommended for funding by the evaluation committee, ONLY ONE had been approved by the LEDL Committee. And even then it had yet to receive any funding at the time of the AGO’s investigation. So, the AGO found that despite the LEDL having being introduced in 2006, nine years later, only one development project had ever been approved for funding and even that solitary project was yet to receive any monies. This failure to fund any approved community development projects in logging areas, is though just the tip of the iceberg when it comes to the findings of the Auditor General. For starters there is K4 million which the AGO found simply vanished. Log exporters pay LEDL to the Customs Service which deposits the funds into a withholding trust account. The funds are then transferred to a main trust account. The Auditor General describes the transfer from one trust account to another as “an unnecessary step”. The amounts deposited into the withholding account do not reconcile with the amounts received in the main trust account either cumulatively or individually in any year since 2012. The overall shortfall in the main trust account is almost K4 million. Added to this K4 million, there was a further discrepancy discovered between SGS records and Customs Service records on the amount of levy collected. The SGS figure for the collection is K961,000 higher than that shown in the customs records. Unsurprisingly, the AGO concluded there were “significant weakness in the system”. As a result “on average 1.5 million Kina for each year between 2012 and 2015 was not paid into the trust fund”. The weaknesses included “a lack of adequate documentation in relation to deposits and withdrawals from the trust fund and transfers between the funds”. The lack of available documentation also extended to the projects that applied for funding from the LEDL, including those recommended to the Committee for approval. The PNGFA failed to supply the AGO with any project submission documents, endorsements from the various committees supposed to vet and approve projects, tender documents or project evaluation reports. There was also no documentation available to show the recommendations that were made as to which projects to approve, and those that should be rejected. Indeed, the AGO found there “were no records kept of committee proceedings”. Remember, this is a Committee made up of the three trustees responsible for LEDL funds, amounting to well over K100 million, yet there are no records of their meetings, deliberations and decisions! The lack of records becomes even more suspicious in light of the fact that nine projects, with a total value of over K36 million, which were never vetted or recommended for funding by the PNGFA, have been supposedly approved by the committee. With the absence of any documentation relating to the Committee deliberations and decisions, the AGO report is silent on how the approved projects found their way into the committees deliberations. Indeed, the AGO states it was unable to determine even IF the projects were approved in formal LEDL committee meetings, with all the members present as “there were no records kept of committee proceedings”. Although the AGO report does not inquire into any of the projects supposedly approved by the Committee, perhaps because there was no documentation made available on any of them, the list is worth looking at in greater detail. K3.2m was awarded to Manibem Timber & Earth Moving Construction Ltd for a “timber processing project”. Timber processing sounds worthwhile as a community development project but does it fit with the statutory requirement for an “agriculture or infrastructure development project”? Manibem Timber & Earth Moving Construction Ltd is owned by Balthazar Kerry and Blasius Andik, whose listed residential addresses is in Port Moresby. The company, registered in 2010, has never filed an annual return. Tavak Investment Limited from Tabar Island hasn’t filed an Annual Return since 2007, when it declared its assets as K4. Nonetheless, it had two cocao processing and export projects approved for K2.74 million in funding. The company is owned by Joe Panga, John Same, Bernard Bote and Simon Lavaso. 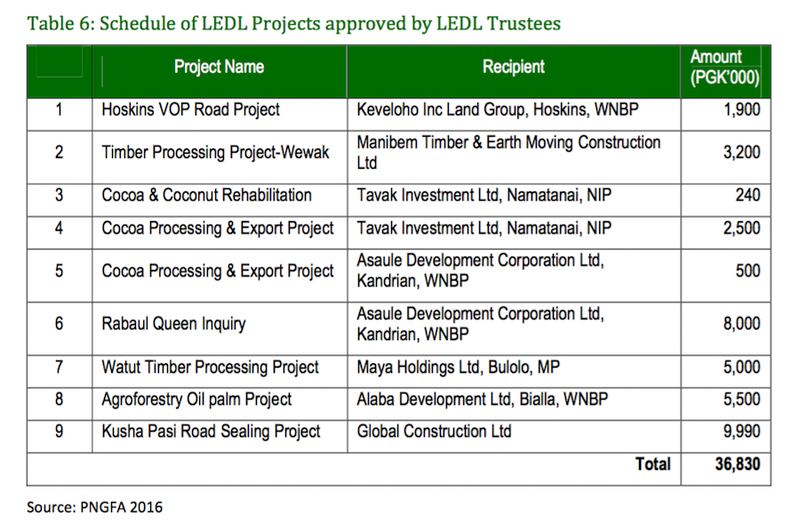 The largest amount of project funding approved by the LEDL trustees, according to the AGO, was K8 million awarded to Asaule Development Corporation Limited in West New Britain for the “Rabaul Queen Inquiry”. The MV Rabaul Queen’s sinking was, of course, one of the nation’s worst ever peacetime maritime disasters. At least 172 people tragically lost their lives when the ferry sank in February 2012. But why was the Asaule Development Corporation, a company owned until his death in 2017 by Henry Maisam, awarded K8 million from the LEDL trust fund for a project titled “Rabaul Queen Inquiry”? The same company was also awarded K500,000 for a “cocoa processing and export project”. According to the records of the Investment Promotion Authority, there is no company registered in PNG with the name Maya Holdings Ltd. Yet the AGO says a company with that name was awarded K5 million for the “Watut Timber Processing Project”. There is though a Maiya Holdings Ltd, owned by Petrus Yang. Yang and his four fellow directors all list their addresses as Watut in the Bulolo district of Morobe Province. Maiya has not filed an annual return since 2010 and at that time reported no activities, and assets of K100. Alaba Development Corporation Limited is the first company on the list of approved funding recipients that does seem to have greater bona fides. It is 99% owned by Nixon Volele. Although, again, the company hasn’t filed an annual return since 2010, at that time it was stated to have interests including a service station, oil palm estate and mini-sawmill. The company had declared assets of K900,000. The LEDL Committee awarded the company K5.5 million for an “agro-forestry oil palm project”. In none of these cases is there any indication the approved project proposal was submitted by the relevant local level or Provincial government, as required by law. Compounding these problems, the Finance Department and the PNGFA were not able to provide the AGO with any accounting records showing how the funds in the trust had been managed. This included no casebooks or revenue and expenditure ledgers. Nor was there supporting documentation such a vouchers and registers. The AGO calmly states: “without documentation, there is a risk LEDL funds are being applied for unauthorised purposes”. The evidence presented by the AGO, from an analysis of bank statements, very clearly shows that this has been the case. Although the projects approved by the LEDL Committee total K36 million, in the four years from 2012-15, K169 million was expended from the Trust Account. The biggest beneficiary was the PNG government. In December 2014, the government sequestrated K80 million from the LEDL trust account and transferred it to the Bank of PNG to fund the Supplementary (Appropriation) Bill. This transaction was in breach of the trust instrument, as the LEDL trust account is not part of the Consolidated Revenue Fund. Similarly, in February 2012, K5 million was paid to the Morobe Disaster and Emergency Committee. The AGO was not able to determine the nature or purpose of the payment as there was no supporting document but noted it “appears not to be related to a [approved] project”. For the period 2012-15, the AGO identified 15 payments made from the trust fund where there was only limited or in some cases no record of the payees. These payments totalled over K48 million. K9.996 million paid to Global Construction matches the approved Kusha Pasi road sealing project. The AGO also found six payments, totalling K117 million, exceeded the K5 million limit imposed on projects in the LADL administrative guidelines. One of those payments was of course the K80 million made to Bank PNG in order to fund the 2014 supplementary budget. The AGO discovered a belated attempt to channel LEDL funds back into areas affected by logging. This was done by paying the funds directly to District Treasuries for disbursement. 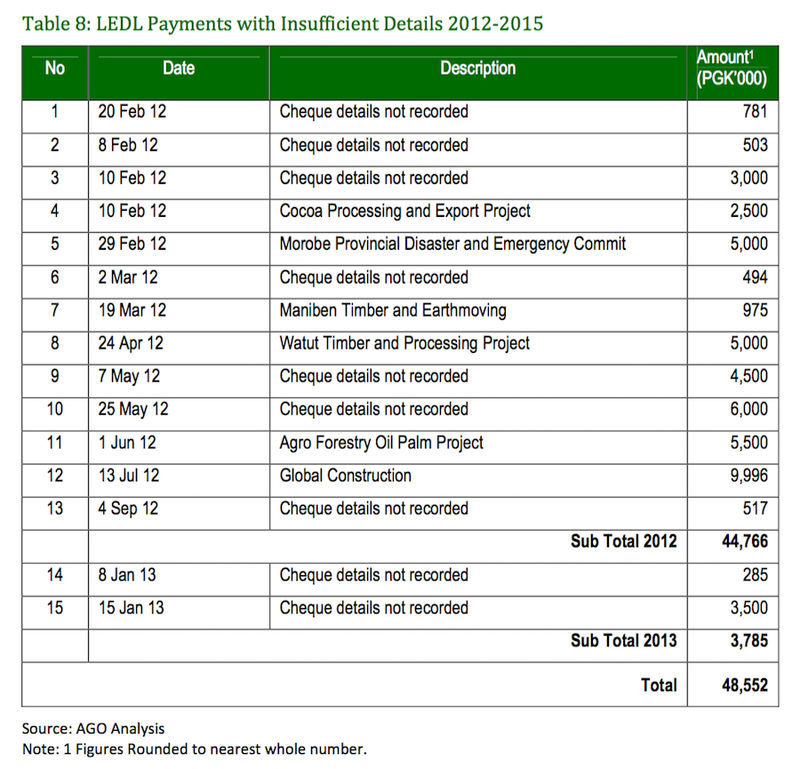 Between 2012 and 2015, the AGO says LEDL payments totalling K41 million were made direct to districts affected by logging. Unfortunately this was also in breach of LEDL guidelines. Although the guidelines were revised in 2013 to allow payments to District Treasuries in area where logging was taking place, those changes were never endorsed and approved by the LEDL Committee as required. In any event, the payments dd not even comply with the revised guidelines. The payments were not accompanied with the necessary administrative notes and were not supported by project proposals, the necessary endorsement from the Joint District Planning Committee and were not approved by the LEDL Trustees. The record on monitoring and evaluation the spending of LEDL funds is, as might be expected by now in the light of the above findings, abysmal. According to the legislation and administrative guidelines, the LEDL Committee, Provincial and Local Level governments, District and Provincial Administrators, Provincial Works Managers, and PNGFA staff are all supposed to take a role in the monitoring and evaluation of the implementation of approved projects. Despite all the detailed legislative and administrative guidelines, the AGO found “there was no evidence that any kind of monitoring reports from monitoring agencies have been compiled”. At the time of the audit in March 2016, not one single certificate of completion of an approved project implemented since the establishment of the trust fund in 2007 was available. The LEDL Committee, which comprises the fund trustees, are required under the Forestry Act to provide reports every six-months to the Secretary Treasury on the implementation of funded projects. No such reports could be provided to the AGO. What the Auditor General has uncovered is a debacle. A complete failure by government agencies to properly administer and account for over K100 million collected on behalf of rural communities has been compounded by the government’s decision to unlawfully help itself to K80 million of those funds. Monies held in trust for rural communities and earmarked for their development has been unlawfully taken from them without their consent and with the intention of permanently depriving them of its use. This is theft. The three people appointed by Statute as trustees of the LEDL funds are the Secretary of Finance, the Secretary of Planning and the Managing Director of the PNG Forest Authority. They or their nominees were also the three members of the LEDL Committee. For the key period of the AGO audit, 2012-15 the relevant people included Ken Ngangan and Kanawi Pouru. It seems, from the AGO findings, either they knew what was going on and conspired in the mismanagement or did not take any effective action to prevent it, or they failed in their duties by simply being unaware of what was happening to the money. It is pointless to ask whether the police fraud and anti-corruption squad will investigate. Of course they won’t. The LEDL is just one more scandal that will be quietly forgotten.